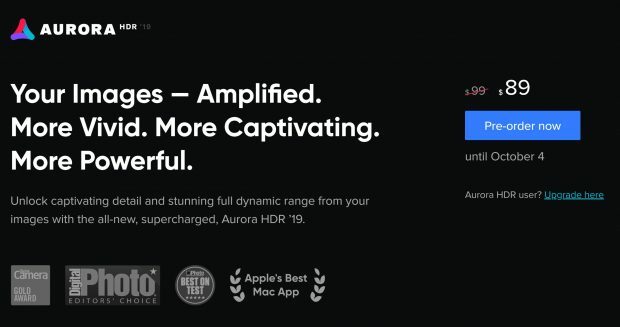 You Can now Pre-order AI-powered Aurora HDR 2019 for $10 Off ! The AI Powered Aurora HDR 2019 now available for pre-order online. The latest iteration comes with a Quantum HDR Engine, a new tone mapping algorithm powered by AI that uses neural networks to quickly and efficiently create some pretty realistic and immersive high dynamic range photographs. Author adminPosted on September 12, 2018 September 12, 2018 Categories Nikon AccessoriesTags Aurora HDR 2019Leave a comment on You Can now Pre-order AI-powered Aurora HDR 2019 for $10 Off !